Western Europe accounted for almost half of all wine sold in glass in 2012, with demand led by the big wine producing countries of Germany, France and Italy, as well as the UK, primarily through still light grape wine. The top three countries effectively account for almost a third of global glass bottles sales made in the wine industry and 59% of sales in Western Europe. As such a developed region for wine, Western Europe is also, unsurprisingly, more complex and diverse when it comes to wine packaging choices, being very much ruled by varying wine consumption occasions and consumer needs. The stronghold of glass within the European wine market is not without its challenges, and alternative packs like beverage cans are seeing growth amongst younger consumer groups through fashion-conscious, branded wine offerings. 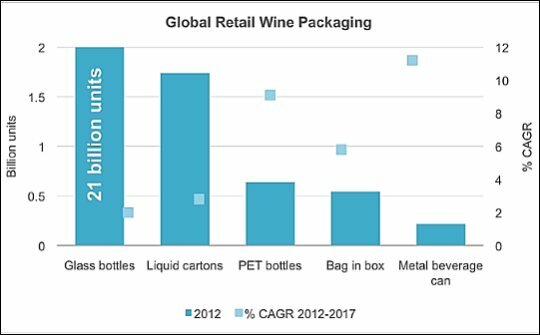 Glass, which nevertheless looks set to account for 90% of Western Europe’s still light grape wine packaging sales in 2013, has in recent years lost some position to liquid cartons. The brick carton is favoured by price-sensitive wine consumers purchasing economy variants, especially evident in Italy while shaped cartons have shown appeal amongst British consumers for outdoor consumption. In the run-up to 2017 however, the bag in box looks set to be more of a rival to the glass bottle. Its volume sales are expected to grow by another 27 million units in France alone, where this lighter alternative is offering retailers reduced operational costs whilst also providing consumers with decent product quality for that daily glass of wine over a meal. Conversely, an aperitif culture in Germany is seeing consumption of wine at meal times become more popular, representing an opportunity for glass. Outside Europe, the future of glass is particularly bright in China, where a growing mid-income population continues to embrace the culture of drinking wine, with little prospect of competition from other pack formats. From a relatively low base at present, there is strong growth potential, associated especially with the health perception of red wine.. The increasing penetration of a Western wine culture in China is also driving the rising acceptance of wine drinking among Chinese consumers, snatching share from local spirits, beer and non-grape wines. Glass bottles are expected to record 9% CAGR growth in unit volume between 2012 and 2017, adding 1.5 billion units to Chinese retail consumption in wine. While glass bottles continue to dominate as preferred pack format in wine, new pack types are increasingly being introduced. With 6% retail unit volume growth globally over 2012, the bag in box has some good years ahead. 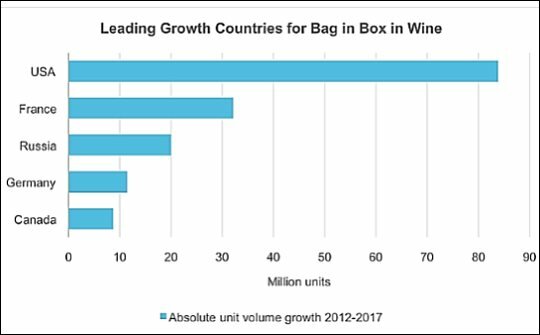 Bag in box is expanding rapidly among some of the largest wine drinking countries in North America and also Europe. The US is the biggest world market for bag in box sales and posted 8% unit volume growth in 2012. The economy factor offered by the bag in box format in comparison to the glass bottle has been taken on positively by American consumers, who are already familiar with value for money packaging alternatives in spirits and beer, in particular through the use of PET bottles. Convenience is the second driver behind the success of bag in box in the US, with the three-litre format largely benefiting from a growing pattern of wine consumption outdoors as its size and light weight nature enables it to be easily carried to the park or beach. Perhaps most interestingly, after the US, France is offering some of the best prospects for bag in box at the expense of glass. This is a traditional wine drinking country and also one of the biggest consumers in Europe in retail litreage volumes. The French model is characterised by a high demand for value for money wine combined with a good range of quality offerings endorsed by retailers. This contrasts with Italy and Spain, where wine drinking remains more tied to the ritual of the glass bottle. However, provided that bag in box suppliers can work with private label suppliers, something similar to the French model could start to be seen in other such neighbouring countries. Wine in beverage cans has proved highly successful in certain countries. There is no doubt that the pack type will continue to feature very much as a niche operator but is continuing to gain popularity in those countries where it has established itself. Sales of wine in metal beverage cans rose by 19% CAGR over 2007-2012, and are expected to continue growing, at an 11% CAGR through to 2017, adding a further 152 million units globally. Beverage cans are proving especially popular for on-the-go consumption of wine, as they are light, convenient and easy to transport. They are single-serve, further holding strong seasonal appeal for outdoor consumption in the summer months. Importantly for the wine category, the beverage can has offered a way of bringing wine to a new generation of younger drinkers. The US, Germany and United Kingdom are the top countries for wine sold in beverage cans, these three markets account for more than 80% of global retail wine sold in beverage cans. In the US, wine consumption continues to benefit from new wine drinkers, particularly millennials. These younger drinkers continue to break from the historical pattern of entering the alcoholic drinks market through beer and then moving to wine/spirits later. Today, many young people have come to really love wine, and this has been driven, in part, by sweeter offerings such as riesling and moscato varieties that do not require the “acquired taste” of some other wines. They are also, in some way, changing the way wine is typically consumed, drinking it chilled or on the rocks. The beverage can has been a winner here, providing consumers with the option of buying wine that is chilled, in smaller, on-the-go pack sizes. In the UK, beverage can suppliers like Rexam are keen to see sales develop to levels more akin to those already seen in Germany for sparkling wine in particular, and there is no doubt that the prospects look good, given developments to date. It will, however, always remain a niche player on the packaging front, but proving to be an option that can capture growth amongst less traditional wine drinkers and those looking for on-the-go packaging solutions.